While technology may have dramatically changed the solar sales landscape, most solar installers still use good ol’ door-to-door prospecting as a cornerstone of their sales process. And with solid data now showing that you have 7 seconds (or less!) to make a first impression, it’s critical to be aware of the message you’re sending once that prospective client opens the door. So as the solar high season winds down and you prepare to hit the pavement to close those last few deals, here are a few simple ways your body language might help you earn trust and seal the deal. While it may seem obvious that we need to be mindful of people feeling safe when they open the doors to their homes, it turns out that there’s tangible science behind finding the perfect distance at which to stand for any given social situation — it’s called Proxemics. Here are the distances most Americans feel most comfortable with, according to social proximity. With that in mind, make sure you’re at least 8 feet away from the door when you ring — people will quickly understand you’re respectful of their space and are likelier to open the door and hear you out. While we may not be aware of it, our hands say a lot about how comfortable, engaged and confident we are. In fact, research by Holler and Beattie has shown that gestures can increase the value of our message by up to 60 per cent! So as you stand outside the door waiting for an answer, make sure your hands aren’t in your pockets or tensed into any kind of unconscious or nervous fist. To communicate transparency and trust-worthiness, experts recommend you keep your hands open, with palms facing the person you’re talking to at a 45-degree angle. To communicate confidence or put emphasis on a technical element of your pitch, you might also want to try laying your hands down flat, palm down, onto a table. And most importantly, no matter how much you may disagree with your prospective buyer, try to avoid crossing your arms, as this can easily be interpreted as defensiveness or disengagement from the conversation. I’ll spare you the cliché about the eyes being the windows to the soul, but nonetheless, the eyes play a tremendous role in helping us build trust and credibility. Maintaining steady but natural eye contact communicates the fact that you’re engaged and have nothing to hide. Conversely, letting your eyes constantly shift elsewhere or to a specific item like your watch or pen can convey dangerous indifference or impatience that could force the homeowner to feel defensive or unheard. Paying close attention to the other person’s eye contact is also key to understanding where they stand. In fact, science showsthat a client making eye contact 60–70% of the time is indicating not only interest in you but agreement.” So if someone’s eyes are constantly wandering to the door — it may be best to set a further appointment or ask them if they have any questions or concerns. But if they’re eyeing that pen in your pocket, it might be the perfect time to get them to sign on the dotted line. While many of us have long known that our faces can give usaway, we often underestimate what our feet might have to say. Just as it’s important for your shoulders to squarely face the other person in order for them to understand that you’re fully committed to the conversation, it’s essential for both of your feet to point towards your prospective client in order for them to like you’re listening intently to their questions and concerns. Stance can also play a big role in asserting confidence or communicating fear. 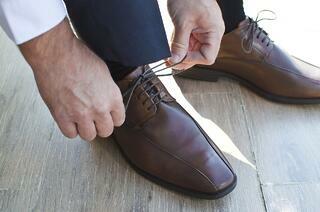 “Feet say a lot about self-confidence. When you stand with your feet close together, you appear timid or hesitant. When you widen your stance, you look more solid and sure of yourself.” And of course, if your feet stand unnaturally far apart, you may be perceived as trying to intimidate or dominate — which is rarely what we’re looking for when we’re opening the door to a complete stranger. The gist of it? Your body language matters in a big way. Believe it or not, it may even matter more than what you actually have to say! 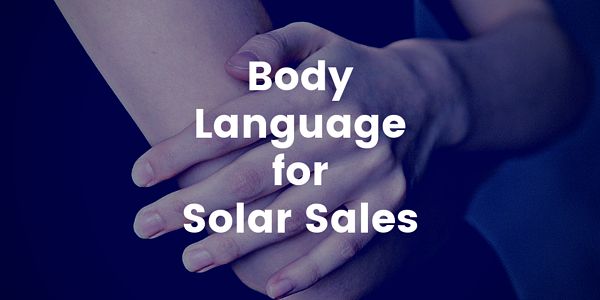 “55% of the effectiveness of your communication comes from sales body language, 38% from the tone of your voice and only 7% from what you actually say.” Have you changed your body language since you started working in solar sales? If so, we want to hear from you!